The Mega Millions lottery is up to $540 million and still growing for the draw to happen on March 30. If you win this lottery, the payout is somewhere around $389 million. The lottery craze swept through my office and recently my brother told me I should play. The CA Lottery website has a feature where you can download the data set of the past winners. The data dates back to the year 2000. After creating my formulas I was set to make the parameters. The result is the following PDF, CA Lottery Picks 2012. This PDF contains the winning numbers constrained by date. Past winning numbers for 3 months, 6 months, 1 year, 2, years, 3 years, 5 years, 7 years, and 10 years. 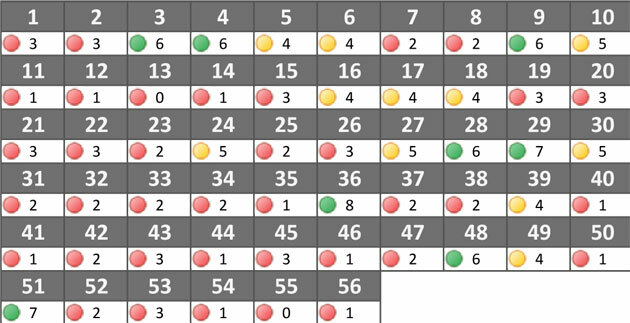 Adding the color coding helps to visually find the numbers most picked. There were some rules that I had to adjust for the color combinations. Between 3 months and 5 years, anything above 75% showed up as green, less than 75% and greater than 50% are in yellow, and under 50% are in red. Between 5 years and 10 years, I had to adjust the percentages where green were the ones that came up more than 90% of the time. That change became apparent when the number of instances of the numbers started to plateau and the variation between the lowest instances to the highest number of instances tapered off. From these numbers I generated 5 sets of numbers, showed off my spreadsheet, made deals to split the money, crossed my fingers, and purchased some tickets. We’ll see what happens tomorrow night.